There are a number of settings that can be changed to affect various ways the game works. 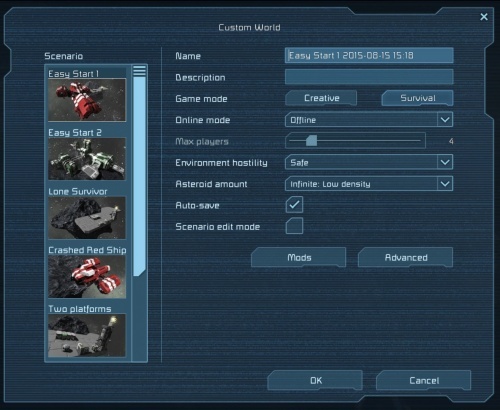 They can be set when creating a new world or adjusted on existing worlds by selecting them in the load menu and clicking "edit settings". Start on a fully-equipped platform with 3 small ships (a miner, a fighter and a builder) and 2 large ships (the blue ship and the red ship featured in one of the menu loops). Start with a complex, fully-equipped asteroid base with many small ships and the 2 large ships. Start on the same fully-equipped platform as Easy Start 1, but without ships. Start with the aftermath of the red ship flying into an asteroid. Has two fully-equipped platforms at opposite ends of the asteroid field. Recommended for PvP. Start in a spawn ship in an asteroid field. An empty world; no platform, no ships, no asteroids. Completely unsuitable for Survival Mode, as progress is impossible. Start on a planetary base with (EDIT FOR SHIPS), but beware of hostile Drones, Pirates and Cyberhounds. Start in a spawn ship in space with an Earth like planet and Moon like moon. The name of the world, which will appear both in the "Load World" menu and in the "Join World" menu (if your world is open for others to join). A short description of the world. Appears when you mouse over the world in the "Load World" menu. Sets the world to either Creative or Survival Mode. Infinite resources, instant building, instant welding of projected blocks, systems do not require resources (e.g. Uranium or Ice) to function, weapons do not use ammo. Resources must be mined and refined. Blocks can still be placed instantly, but require components and welding before they are functional. Systems require and use up resources. Determines whether or not people can connect to you for online multiplayer. The world is not visible on the "Join World" menu, and is not joinable in any way. Singleplayer mode is active, meaning you can pause the game. The world is not visible on the "Join World" menu. It is joinable, but only with an invite. The world appears on the "Join World" menu to your Steam friends, and is joinable by them. People who are not friends with you on Steam will not see the game, but they can still join if they are invited into it. The world is visible on the "Join World" menu to everyone online on Steam, and is joinable by them. Affects the frequency and severity of Meteor Storms. Meteor storms will not occur. Meteor storms will occur rarely and in smaller numbers, causing minor damage. Meteor storms occur regularly, in decent numbers, and can cause serious damage. Meteors never stop. Meteors are on fire. Meteors will cause major damage. Good luck. When turned on, the world will automatically save at regular intervals. This option enables the world to be edited with scenario options available. As of patch 01.042, mod integration with steam workshop was introduced. This feature in addition allows players to select specific mods to add to their worlds. To learn how the mod page works, see Mods guide on steam by Marek Rosa. This page determines the spawning parameters of asteroids and planet flora. Not available if you have picked the "Empty World" scenario. Affects the amount of pseudo-randomly generated asteroids in the game world. Important for Survival Mode, as they are your source of ores. Flora density controls the spawning ratio of both tree/plants, and mineral rocks that are scattered around the surface of a Planet or Moon. Advanced settings to further customize your world. Only available in Survival Mode Affects the size of the inventories (both the player's and most storage blocks). Only available in Survival Mode. Affects the speed of and the amount of ingots used by the Assembler to produce Components. // I am unsure if this setting affects Arc Furnace, can anyone check? Only available in Survival Mode. Affects the speed that the Refinery processes ores. as of patch 01.035.005, players are allowed to set the size of the world. The game area is limited to a cube with a size of the players choosing. Any object that passes outside the border is removed from the world. Any players that cross the border, will be killed. As of patch 01.042, when a player approaches the border, a warning is displayed on-screen, informing the player the distance, and consequences of crossing it. The world size has no boundaries, and is unlimited. Object deletion and player killed by border is disabled. When player spawns with a ship, cooldowns are applied to prevent players from repeatedly respawning and grinding them for resources. Each spawn ship has it's own cooldown based on ship's value. Cooldowns are not applied per ship, but per respawn. This means that every time you respawn on a ship, cooldowns will be reapplied for all ships. This setting allows cooldown length adjustment. Note: you can respawn in suit at any time. View distance affects how far a player is able to see. The larger is view distance, the more objects potentially can be seen on screen simultaneously, causing game performance to drop. Only available in Survival Mode. If turned on, you will gradually heal up to 70% health without the need for a Medical Room. Only available in Creative Mode. Determines whether or not players are allowed to cut, copy and paste (including pasting from blueprints). This allows you to copy entire ships or stations and paste them wherever you feel like. If you cut an object, a confirmation message will show up. The deleted object will be in your clipboard. Enables the ability for clients on the world to save the world, as opposed to just the server. Determines whether or not weapons will work. If turned off, trying to a fire a weapon will display a warning message. If checked, ice, pressurization, and Oxygen circulation mechanics will be enabled in the world. Players will need oxygen to survive, and the suit will also have a specific amount of oxygen in it. If players do not replenish their oxygen or they are not in a pressurized environment, they will die. If checked, disables any players ability to select a respawn ship or spawn as a space suit from the respawn screen. The only means of respawning into the world are only through Med-bays. If enabled, the player(s) will be able to use their jetpack to fly around in the world. However, if disabled, you will not be able to navigate in non-gravity environments without getting stuck. Jetpacks will drain hydrogen when used. If enabled, players can mine/destroy asteroids, rocks, or the surface of a planet. If disabled, these are immune to mining and damage. If checked, allows Sabiroids to spawn, and appear on the Alien planet and certain moons. If enabled, if a player exits the world (leaves a server), it will delete the respawn ship they had in their possession at the start. When turned on, players who are in your line-of-sight will have their names displayed above their heads. When turned on, thrusters will damage objects behind them. If the space directly behind thruster is less than 4 blocks for small or 7 blocks for large thruster, the flames will damage anything on their way in a cross pattern. When turned on, Cargo Ships will randomly spawn. Enables in-game scripts to be run on programmable blocks. Turned on by default, when turned off it prevents any players in the world from being able to use 3rd view of their character/ship and restricts it to first-person. If checked, player(s) will spawn with a standard Automatic_Rifle, Hand Grinder, Hand_Drill, and Hand Welder. Upon death, players will still respawn with the above listed tools. If checked, enables hostile NPC drones to occasionally spawn and attack the player(s). This resets the Ownership of all objects in the world to "No one". See Factions. If checked, this option allows a player to permanently lose control of their ships and/or stations if they die, and do not have a Med-bay to spawn into. If disabled, the player will still maintain control of their property regardless of spawning in a Med-bay or a new respawn ship. If checked, blocks can be damaged, deformed or destroyed. When turned on, ship grinders and drills will shake the player/ship when grinding or drilling. The amount of force applied depends on how many dills/grinders you are using on a ship, and the amount of mass/thrust is countering it. If left unchecked, stations that are not attached to the surface of an Asteroid, Planet, or Moon will behave like large ship blocks and will not be static. They are susceptible to the same physics and mechanics as Large Ships and may drift uncontrollably without thrusters. If a station that is properly attached to a voxel has its anchor points that keep it attached destroyed, the station will break away and will no longer be static. When this setting is checked, stations will always remain static and will not move. If checked, this forces all players to start in the respawn screen upon entering the game. If checked, allows Cyberhounds to spawn, and appear on the Earth planet. This page was last modified on 2 October 2018, at 14:00.